One of these days, I will learn to draw with pastels. It will not be during my donkey challenge, however. 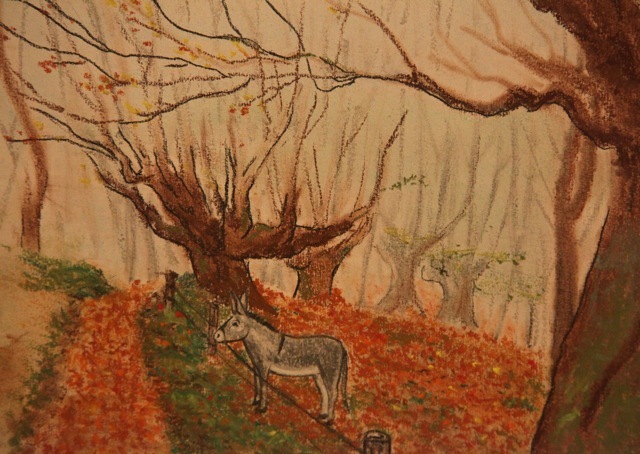 Back in 1998 (yes, I remember the date), I bought a set of chalk pastels without ever having tried my hand at them. Most of the pastel sticks are now broken but barely used. It is just not a medium I really enjoy. I don't even know if I could learn to like it. Maybe one of these days, I won't learn! * Even doing pages and pages of collage** sounds more fun than doing pages and pages of pastels. See? I'm learning. And gaining perspective. ** Actually, it isn't the thought of doing one book of collage illustrations that bothers me; it is the thought that if I do decide to do more stories in this world, I would have to continue with a consistent look and feel. Doing books and books of collages...meh. So glad you didn't throw it away! I'm loving seeing donkeys in all these different media. This one I love for the autumnal quality--the way the leaves blanket the ground: it is just like a late-autumn woods. I'm really enjoying the donkeys and the colours in this are great. This donkey looks wistful. I think he is lonely without anyone to share his pasture. Have you considered doing each illustration for the book in a different medium? That could be really cool. That could be cool. Tricky, too, though, i would think, making sure there is coherency despite the wildly different media. I love it! Great details and I love the contrast of colors between the bare trees and the colored leaves on the ground. Pastels can be a challenge, for sure. If you like the idea of drawing with colored sticks, you might try oil pastels. I have a set and they perform like amazing crayons -- much more fluid than the waxy ones we give children, deep colors, and such. I like them better than chalk pastels. I like the expectant look on the donkey's face. He's there waiting for something, but we don't know what.